To make sense of the fast-developing situation at California's Oroville Dam, Chris spoke today with Scott Cahill, an expert with 40 years of experience on large construction and development projects on hundreds of dams, many of them earthen embankment ones like the dam at Oroville. Scott has authored numerous white papers on dam management, he's a FEMA trainer for dam safety, and is the current owner of Watershed Services of Ohio which specializes in dam projects across the eastern US. Suffice it to say, he knows his "dam" stuff. Sadly, Scott explains how this crisis was easily avoidable. The points of failure in Oroville's infrastructure were identified many years ago, and the cost of making the needed repairs was quite small -- around $6 million. But for short-sighted reasons, the repairs were not funded; and now the bill to fix the resultant damage will likely be on the order of magnitude of over $200 million. Which does not factor in the environmental carnage being caused by flooding downstream ecosystems with high-sediment water or the costs involved with evacuating the 200,000 residents living nearby the dam. Oh, and of course, these projected costs will skyrocket higher should a catastrophic failure occur; which can't be lightly dismissed at this point. Scott explains to Chris how this crisis is indicative of the neglect rampant across the entire US national dam system. Oroville is one of the best-managed and maintained dams in the country. If it still suffered from too much deferred maintenance, imagine how vulnerable the country's thousands and thousands of smaller dams are. Trillions of dollars are needed to bring our national dams up to satisfactory status. How much else is needed for the country's roads, railsystems, waterworks, power grids, etc? Both Chris and Scott agree that individuals need to shoulder more personal responsibility for their safety than the government advises, as -- let's face it -- the government rarely admits there's a problem until it's an emergency. Katrina, Fukushima, Oroville -- we need to critically parse the information being given to us when the government and media say 'it's all under control', as well as have emergency preparations already in place should swift action be necessary. Click the play button below to listen to Chris' interview with Scott Cahill (47m:13s). Announcer: Welcome to crash concepts, where the economy, the energy and the environment are explored. Up next, fresh ideas and insights into the factors that are driving the world and shaping your future. Presenting information you can’t afford to live without, here’s Chris Martenson. Chris Martenson: Welcome everyone to this Peak Prosperity podcast. It is February 13, 2017 and I’m Chris Martenson. Of course, for the past week Oroville Dam in Oroville, California has been rapidly filling up, and then finally topping over the emergency spillway. All week as well the authorities, and media, have been saying “Everything is fine”, “No worries”, “All is under control”. And then suddenly, last night, Sunday night the 12th of February the emergency notice went out for 10,000 people to evacuate just the low lying areas downstream from Oroville itself to Gridley, California. Within hours that had been expanded to nearly 190,000 people. Cars were packed with people who left with literally the shirts on their backs, not having had any sufficient warning to do anything more than that. And we know this, because they were so hopelessly stuck in stopped traffic that reporters were able to walk up, knock on windows and conduct full interviews. Now, as soon as I became aware of the situation I began to scour the net for useful, high quality information. As you know in the early times, sometimes it’s very difficult to find out what’s going on. Now one piece I came across was written by Scott Cahill, a dam contractor with tons of experience in the sorts of dams that we see at Oroville. It caught me right away, his piece of writing, as being full of actual terms and experience and knowledge; so I wanted to bring him on to discuss both this dam and the situation in Oroville, and the general state of dams in the United States more broadly. As you know, we discuss infrastructure here and the sorry state of it from time to time and now we have a perfect reason to re-engage in that conversation. Scott Cahill, he’s a construction expert, a writer, a speech writer, public speaker, expert witness, sailor, hey he’s a pilot too. He has 40 years of large construction and development experience with over half a billion in completed projects, including very high security installations and very high level finish work – including stuff for the FBI, CIA, Armed Forces, military installations. He’s done work on hospitals, water and waste-water, bridges, airports, industrial and commercial institutional buildings and, of course, dams. He’s been a professional witness for construction issues and for dam issues and is a FEMA trainer for dam safety. Has dozens of papers and presentations on dam safety to his name. He is currently the owner of Watershed Services of Ohio, which completes work on dams in the Eastern US, including specialty underwater and diving work. So, with all of that said, welcome Scott. Hey, thank you so much for joining us on such short notice. Scott Cahill: It’s great to be here, and thank you for having me, Chris. Chris Martenson: Well now, first Scott did I leave anything out that people might need to know, or want to know about you to assess your qualifications or experience here? Scott Cahill: No, I think you’ve got it. For the last 20 years or so I’ve done dams almost exclusively; so I’ve had the opportunity to work on literally hundreds of dams. Many, many of them earth and embankment dams of the sort that we’re talking about here with Lake Oroville. Chris Martenson: All right, and so let’s talk about that for a second, earth and embankment dams. What is it that you’ve experienced with them, and what do we need to know about them? Scott Cahill: Well, an earth and embankment dam like the one that we’re talking about here, is generally an earth and fill that takes place between two abutting surfaces. In this case, it’s fairly high recovery rock on either side, which form the abutments. And then the central dam itself is placed out of soils, which are compacted in place. The Oroville Dam has a semi-permease centroid, which is made up of graded clays and it has a – the mass of the dam, which creates the sloped surfaces, the faces of the dam, if you will, is composed of a stony soil, which was mined close by and brought to the site by train. It has a chimney drain in it to vent phreatic water, which is the groundwater that migrates laterally through a dam; so that it doesn’t manifest on the downstream face and cause it to be wet and to slough. The mass of the dam itself, actually the weight of the soils are what resist the forces, the lateral forces of the water that are induced on it. So, it’s a magnificently large damn, 770 feet tall, and 6,920 feet long, a massive, massive, massive dam built in 1968. Chris Martenson: Now Scott, I’ve built dams like this at the beach before when you have water coming back down. And, again you have the two faces and you slope them all up. And my experience with those at the beach is that everything is cool, until it’s not. The worry being that once water begins to penetrate anywhere along there it’s over pretty quick. Is that the general nature of earth and dams? Is that a feature that would be applicable here at Oroville, or is that just something that you find in sand at the beach? Scott Cahill: No, it is so close that it’s frightening, Chris. That’s exactly what we’re talking about here. We have the dam itself, which is made up of erodible soils. Adjacent to the dam in what’s called the groin, where the dam abuts the abutting soils. We have the principle spillway and then farther, laterally from the dam itself we have the emergency spillway. And, they are, as much as possible, are in a surface that’s rock. And that is the situation with Oroville. Chris Martenson: All right, so just to be clear there’s only a few ways for water to, on an approved basis, leave Lake Oroville. And one is through the electrical generating facilities that are at the base of the dam. The second would be what we’re calling the spillway, and then as you mentioned a little further along – so for facing the dam you know towards the lake. Further along to the left is the emergency spillway, which by the way got renamed the auxiliary spillway at some point during the week. I guess to take the word “emergency” out of the title. But, those are the three places, and I heard they shut down the power generating station for some reason. All this water is going down the spillway, which is where some trouble emerged. And then also water was topping and going over the emergency spillway, if we can just use that word. It’s easier for me to pronounce auxillary. So, tell us what happened? What – how did this develop and what occurred here? Scott Cahill: Well the principle spillway, the normal way that we move water from the basin, from the pool out to discharge it is along the principle spillway. It’s lined with concrete, what we call plate slabs, concrete slabs which are reinforced on the base, and then training walls on either side. The water travels down, going through the gates at the crest of the dam, traveling down the spillway at a magnificently high velocity. And, in fact, in this particular dam it’s falling so far, so fast that they put some blocks at the bottom to break up that velocity so it didn’t scour downstream. So, this is a nice, clean, concrete channel that exists down and spilling into the Feather River below. The emergency spillway, in this particular dam, is what we call an ogee weir. It’s a concrete structure with a level top that’s set at an elevation below the crest of the earth of the dam itself, so that in the event that water gets up to that elevation it will begin to spill over that weir and down the side of the abutting soils and into the river below. Chris Martenson: All right. I read an article this morning. It was writing about 12 years ago. Twelve years ago a group, such as the Friends of the Earth, the Sierra Club, the South Yuba Citizens League. They filed a motion with the Federal Government; it was on October 17, 2005. And I’m reading here now from a mercury news article, which I will now quote. “As part of Oroville dams relicensing process urging federal officials to require that the dam’s emergency spillway be armored with concrete, rather than remain as an earth and hillside. Scott, isn’t that exactly what happened here? Scott Cahill: That is precisely what happened here. I also am aware of that action, motion filed with FERC. Yeah, they really understood what the eventuality of the actuation of that emergency spillway may be. And in fact, something that one looks for in doing an inspection of a dam, particularly a FERC regulated dam, is that an emergency spillway produces a flat, canted plain that’s unencumbered by any woody vegetation or brush or anything like that. I don’t know if you saw Chris the pictures of this thing, but this is near forested in this area, covered with trees. In fact literally a day or two before the spillway crested they had employees out pouring concrete in the corner where the ogee weir meets the structure of the gate structure. And also, removing the trees and vegetation from the emergency spillway. So, that’s indicative of improper maintenance of that spillway by, I think, anyone’s feelings as highly unusual to see a high hazard dam. Particularly, a FERC regulated high hazard dam; FERC does a great job with their dams generally. That has vegetation on an emergency spillway, very much a no/no. Chris Martenson: And why is that a no/no? Scott Cahill: The reason for it is that you want as much as possible to have a sheeted flow down that emergency spillway. When such a flow meets a tree, the tree of course will eventually fail. It doesn’t take long, as you can see from the velocities that we’re witnessing in this dam. And then the root ball proceeds down. When the root ball falls out of the embankment, it produces a hole. And that hole produces what we call a hydraulic jump. You can imagine like a tiny waterfall and circulatory water there. And it begins what’s called cutback. It’s an erosion that migrates from the imperfection back toward the basin, toward the pull of the dam. Exactly as has happened in the weathered rock within the emergency spillway. Chris Martenson: All right, so as I understand it right now, the emergency spillway was a problem, you’re right. There were pictures of them, looked like tiny ants, it looked so insignificant, quick shoving some boulders and concrete into some corners of that whole emergency spillway. But the spillway itself, now that we’ve you know been at this for 24 hours, we’ve noticed that yes, there was damage to that spillway that had been noted a long time ago. They had done some sort of a patch. It failed. A huge hole opened up in the main spillway itself and then that was also back eroding, presumably from the same hydraulic hole sort of process you just described with the root ball, only much larger. Let’s talk about the spillway for a moment because that’s what people were worried might fail. What does that even mean, if a spillway fails? Scott Cahill: The primary spillway, this is the concrete structure that we discussed earlier, was last inspected in 2015. During that inspection they did not actually go down into the spillway and shove cameras in holes and look at the soils beneath. From what I understand they did a visual inspection of it from a distance, believe it or not. In 2013, some work took place on the spillway to repair a scour and a failure of the plate slabs and in fact, the failure that’s manifested itself on the spillway today, which is a huge erosion both the plate slabs complete failure and the failure adjacent to the side, under the training wall and out, and basically the bottom third or half of the spillway is now gone. That happened in exactly the same place, where it initiated. It started in the same place that that work was completed. The other item, Chris, that really promoted me to write my writing on this was a notice – I noticed some photographs of this spillway when it was actuated. There are drains all along the training walls, the two walls on the side of the spillway that form the sluiceway of the spillway. Those drains should be dripping some water, some groundwater that may collect behind those walls. These were not. There was actually – if you look this up online you can see photographs of this where those drains are actually firing water out across the spillway, shooting it out under pressure. That’s indicative of a charge situation where water is getting underneath the spillway and the eventuality of that is a lifting of the slabs and exactly what we saw. When I saw the charge system I came to realize that the principle spillway was in a failure mode and I – that’s what caused me to write the things that I wrote. That I felt that it was imminent that the principle spillway fail. Now, we’re kind of in a worst case scenario, if you will, and I don’t want to be an alarmist, but there are two ways to remove significant amounts of water from that dam. The power plant, Penstock will only move a small amount of water compared to either of the spillways. The principle spillway, which should be the only spillway used, is now severely damaged. They have allowed the emergency spillway to actuate. But on actuating the emergency spillway they find that it’s significantly damaged and has serious cutback that’s going to compromise the dam. So, rain is coming, basin is full, both spillways are damaged. We’re in a very, very serious predicament here with that dam. This is not a good situation to be in. We get to choose which spillway we pour water down. And we will probably choose the spillway that is cutting back the slowest toward the eventuality of erosive pull. Chris Martenson: Well now, wait, that’s important what you’re saying here, Scott, so let me make sure I have this. The choices now include, they’re dumping 100,000 cubic feet per second I believe, or is that – what’s the measure here? Chris Martenson: That’s per second; just massive quantities of water. So they’re still dumping that, that’s coming down the damaged spillway. And they’re doing that because they say, well we’ve got more rain coming, we absolutely don’t want to be topping anymore over the emergency spillway. So, it sounds like they’ve made the decision, based on what you just told me that risking more damage down the main spillway is preferable to any more topping coming over the emergency spillway. They’re kind of – the devil is in – damned if you do, damned if you don’t. But the emergency spillway seems to scare them more than the primary spillway at this point, is that correct? Scott Cahill: Exactly. What they had said is only probably a day ago was that this wasn’t a significant problem because if we simply close the gates, the valves on the top end of the principle spillway, then the water will rise and spill over the emergency spillway and the emergency spillway has a magnificent capacity to move water. Well, when they allowed just a bit of water to run over the emergency spillway they soon found with the velocities of only a portion of the water that could be moving over that emergency spillway. They had such severe scour that they anticipated a failure of the structural elements within 45 minutes. That initiated them moving people out of the inundation zone beneath the dam. And now I believe the thought is that the cut back on the principle spillway is slower than the failure mode on the emergency spillway, so they’re going to vent water down that principle spillway as much as they can without failing that element. Chris Martenson: Now Scott, how would they be tracking the cutback on the spillway at this point in time? How would they really know what’s happening down there? Scott Cahill: Well, I don’t know why this is, Chris, and this sounds silly but these things always seem to happen at night. Nothing happens when you can look at it. And always, it’s almost a joke in the dam safety community that when something bad starts to happen you send a lot of engineers out to look at it. That’s the response. And maybe it works, because at night when these things always seem to happen. They’re visually watching the cutback proceed up the spillway taking plate by plate, and section by section of the training walls, stepping back toward the dam. At the top of the dam there, of course, it breaks over at the crest and falls down the sluiceway of the spillway. At the top there is a large concrete structure. The right hand side of that structure, and in dams we always talk about looking from the reservoir downstream. So, the right hand structure, right hand part of that structure is anchored into bedrock. And the left hand side of that structure comes awfully close to meeting the embankment soils of the dam itself. Of course, if water moves across the embankment soils of the dam, then there will be severe erosion of the dam, and the eventuality of that would be a breach. So, we certainly don’t ever want that to happen. And before that would happen the emergency spillway would run full bore, whether they wanted it to or not. There’s no way to control that. And, as it did, then it would start to take out components. For instance, that ogee weir that we talked about which is the controlling structure. When it did that, it would allow too much water. Another 10-20 feet out of the lake very, very quickly and the result of that failure of the elements, of the emergency spillway will be significant flooding downstream. Chris Martenson: Significant like we’re losing what 20 feet of the lake surface all at once? Well not all at once, but I mean it’s going to drain as fast as it knows how through whatever gap is created, right? Scott Cahill: Exactly, Chris. And unfortunately, in that eventuality, because it would be allowing so much water to move so rapidly down that rock, especially since we now see that the rock is not high recovery, which is very solid rock, but is weathered rock. And we see that it’s actually cutting back under some really slight flows here. That emergency spillway has never been actuated in the history of this dam, since it was constructed in 1968. And we find that after an hour or two we have significant failure of the soils in the abutments. And in fact, a scour that’s headed the whole way back and threatens the ogee weir, the only controlling structure there. So, if the lake was to release, the question then is how much of those abutting soils with an extra 10-20 feet of water rolling down there, extremely violent kind of a hydraulic event, would be eroded away allowing even more of the lake to discharge? Chris Martenson: Now, I haven’t seen any of the actual engineering drawings on this? Do we know where bedrock is under all of this? Scott Cahill: I do not have the geological studies on the thing. You can see bedrock in photographs, so it is obvious that there is bedrock in both of the abutting sections here. You know, there are different grades of bedrock. And they call rock which has been exposed to the surface, as this has, weathered rock, or sometimes rotten rock. That is rock which has fissures and breaks in it, which is erodible under very high velocity. And that is what we’re seeing in this emergency spillway. We’re seeing the rock actually get washed away and leave this void, which is that cutback failure mode. And that void continues to migrate back, threatening the pool itself. Chris Martenson: All right, so Scott take us to the moment – I’m sure this was very difficult for all the people involved who had to make the call. But this went from basically hey we’re a little concerned and maybe 10,000 – you need to go to 188,000. That was a very quick sort of a progression there. Certainly they must have been very worried by what they were seeing at that point in time. How do they make a call like that and what do you think they were seeing that made them so concerned? Scott Cahill: They – what they saw, of course, was this cutback migrating back toward the ogee where – and they recognized the seriousness of that. I think you step into an area there Chris where, I think we have a real failure as a society. And that is that we want to placate people. We want not to upset people. We become so careful that we actually; you know, the way that the conversation went was, there’s no problem, there’s no problem, there’s no problem, evacuate. Scott Cahill: That never should go that way. I find that a real fault. And I think that at the point when an emergency spillway was actuated that had never before been actuated. That means that the water level within Lake Oroville was higher than it had ever been in the history of that dam. Certainly, you’re inducing loads on the dam itself that it’s never seen before. The people downstream have a right to understand that, emphatically. They have a right to be told the truth, and I don’t think that anyone is doing anything with malice here. I think that they’re trying to do their job, trying to serve the people they work for, the owners of the dam, the state. I think they’re trying to do what they believe to be right, but I believe that it results in an unfair situation to the people living below this dam. The way that the communication took place, I have personally have a problem with it. I think that we should have been much more straightforward with people. And we should have said to them, “We’re going to let this actuate and it’s going to be quite an event. And we’re going to watch it and we don’t know what’s going to happen. Hopefully it will be all right, but maybe it won’t be”. And to begin to allow people to start the process of planning, if indeed it became necessary. Worst case scenario that they leave the area, as indeed has played out here. Chris Martenson: All right, indeed I agree with you completely around that because to me it’s tragic that people left with the shirts on their back in many cases, not even have the opportunity to spend 20 minutes gathering family photos or other things like that, or whatever might be needed to spend some time away. But, second of all, they were given no guidance in terms of how long they might be away. And knowing that we have another storm coming and it’s going to take more engineers with more daylight and more eyeballs to sort of assess where things actually are. Putting yourself in the shoes of somebody who does live in one of these downstream communities, perhaps in low lying area. If you lived there, downstream, who would you believe at this point in time? When would you feel comfortable moving back, you personally? Scott Cahill: I – that’s a hard one to answer, truly Chris. It’s a shame. Understand that beneath the conversation there’s a very finite emergency action plan, which was drawn up and practiced and practiced. And in fact, if you look at the FEMA dam safety booklet, on the cover, the front cover of it is a picture of this dam. This dam is on the front cover of the emergency action planning book published by FEMA. So, you know the paper trail behind this is probably very, very sound. The failure, I believe, was in the methodology of conveying this information. And you know I don’t want to be critical of people that are going through hell right now, but I wish that they had let people pack a bag and get it in their car. You can always go back out and get it and say “Wasn’t that silly”? But you know, I wish that they would have said to people the truth. The truth being that we just don’t know. The truth being that there are some things that simply can’t be calculated because they are simply too many variables. Chris Martenson: All right. Personally this is where I, just as a commentary to say everything’s fine, everything’s fine, evacuate. That’s trust damaging, I think. So, for somebody like myself who is kind of safety conscious, I would want to – it would take me a little while to trust their next pronouncements which are everything is okay. Because my instinct is that government officials seem to want to placate. Scott Cahill: It’s a difficult situation. It’s a situation that I’ve dealt with in the arena of dam safety for a very long time. If you remember back a way to Katrina, stay where you are, help is on the way. The question being, can we trust our government to disseminate information to us in our best interest? And I’m afraid Chris, that the answer is we cannot. The ultimate responsibility is on each individual. Where do you get that information that can allow you to make a determination that is valid for yourself? I mean there are people in their 80’s who don’t move quickly. There are people who it’s a big deal to go out and get in the car and move. There are people with disabilities. There are people with special needs. I don’t know. It’s a failure Chris, and we’ve got to do better. We’ve got to do better. I think that – I see these things where we have people who are trained in this and they communicate and I see failure after failure after failure. And to just candidly and honestly answer your question, no I don’t trust what they’re saying myself. I had – when I wrote my piece I had people come on who were engineers and lambast me and say “You don’t know what you’re talking about” and “How could you say these things”? And “It’s completely safe” and “The emergency spillway is huge” and on and on and on. And you know I want to believe that everything is going to be okay, and I don’t want to be an alarmist. But, there is an issue of responsibility there. We have to be telling people what is actually going on and time and time again we have failed to do that honorably and properly. And maybe it’s because we just wish for things to be better. It’s very frightening to be the engineer or the person running a dam that has a serious issue. I imagine these guys are not sleeping at night, are petrified, are worried sick. If they’re not, they should get another job. They should be. But, we have to find a better way to communicate and who can you trust? Chris Martenson and maybe Scott Cahill, for now. I hope that’s improved though, Chris. Chris Martenson: Me too, and I agree completely with what you’ve said. And of course I don’t disagree that people taking more personal responsibility; I don’t disagree with that being a bad thing. I think it’s a good thing. And that’s a more engaged citizenry is a wonderful thing in most cases. In this case though, the Oroville Dam I don’t think was really – Scott I don’t think this was on a lot of people’s radar screen, but as you say this is not just a damn. It’s one of the 20 largest dams in the world. It’s on the cover of the FEMA Emergency manual you talked about for dam safety I believe. And so this is actually a pretty big reservoir for California. What do you think is in the future for the Oroville Dam? Is it just compromised and has to operate at a lower capacity or could it – in your experience can they rehabilitate it to full duty, or what happens now do you think? Scott Cahill: Well what’s going to happen now Chris is that we’re going to spend a magnificent amount of money on a simple problem that could have been satisfied with a very small expenditure? The balance between maintenance and capital projects is ridiculously one sided. And having allowed this to occur, there’s now – when I first wrote my article, I said you’re talking about a $200,000 to $300,000 job to grout under that spillway. And you’re going to be talking about 5 million dollars to repair the hole. Well now in a matter of hours it’s become a 200 million dollar problem. It’s going to be a magnificent amount of money. The state of California cannot afford not to have the water that is held in Lake Oroville. So, we must repair the dam. And on a broader sense we must repair many, many dams. But this particular dam I feel, and of course we don’t know how far this goes. Let us hope that we’re simply repairing some pretty severe erosion, and some serious damage to two spillways. That would be as good as it will get at this point. As bad as it will get at this point would be a V notch breech, which is incorporation of the failure into the dam itself. And that would be very, very difficult indeed. Both from a permitting standpoint and ecological standpoint, and for so many reasons. That would be a very difficult thing and it would be a very difficult thing for the people of California who so desperately need the water. It would take a very long time to get that pool reestablished. Chris Martenson: Right, well especially after they just come out of a pretty punishing drought. Obviously a lot of water sensitivity around these issues now; so this is a – it’s really symbolic on a lot of levels. And so you started to mention what I want to get into here for the final part of this is let’s broaden this up Scott. What about – let’s talk about the state of dams across the US in general. I’m sure it’s a mixed bag, some are probably pretty great shape and some are not. But how many would you say are on the worrisome side of the tracks and how do we measure and talk about that? What’s the language here? Scott Cahill: It’s an interesting problem. The finest dams in the United States I believe are dams which are under the control of the Federal Energy Regulatory Commission, FERC, as is this dam. There are many dams which are in horrible, horrible shape, unbelievable shape across the United States. Many states have 4,000 dams. Many states have 2,000 and 3,000 dams. Of those dams I would imagine that 20% are in an absolutely untenable situation. When we look at this dam, which is a highly regulated dam, a dam more highly regulated than almost any others. They had an emergency spillway filled with trees. They had a principle spillway that was in the process of failing and had been for years. So, if this can exist on one of the most highly regulated dams then one can just interpolate and imagine what the rest of the situation is like. Dams and infrastructure in general in these United States have been ignored since they were constructed; many of them 100 years old. The mass of them more than 50 years old. And the design life when they were constructed, generally 50 years. We – it’s hard politically to go back and spend the money proactively to develop safety because nothing has happened. And so, with dam safety, time and time again we act after the horrible event. Something really horrible happens and someone reacts to that and says, “You know I will never let this happen again”. And indeed we move forward. And then the pressure is off and it’s not frightening anymore and we go back to a level of complacency that allows us to get where we stand today. Dams are in terrible shape in the United States as are all of our infrastructure, bridges, 600,000 bridges with 27% of them not meeting their minimum requirements. A number of these high hazard dams are not even close. There’s a report card given out by the American Society of Civil Engineers and many states, dam inventories are getting D’s, D minuses, D plusses. It’s hard to believe. Certainly someone in the 1960’s would never believe that the United States would have these issues, but we’ve ignored them far too long, Chris. Chris Martenson: I certainly have been reading a lot about that and it’s great to talk with somebody like yourself who put eyes and feet on these things. But when you say maybe 20%, we’re talking thousands and thousands of dams. You mentioned as well that there’s a very asymmetrical balance between maintenance costs and then the capital to fix something. While you were talking I suddenly remember, I haven’t researched this, b so pardon if I get sort of the terms wrong or the dates wrong or whatnot. But I’m thinking of the coal, fly, ash impoundment that Duke Energy lost awhile back, and it just spilled horribly into rivers and you know across the suburban area. Would those impoundments also count as dams or is that something that’s a separate category entirely? Scott Cahill: No they do, they do as do levy’s, as do all of these – anything that creates an embankment of a fluid, water, mud, anything that creates a significant embankment. That – the definition changes a bit from state to state, but all of the levy’s that line, in fact the – this dam downstream has a number of levy’s also that are at risk obviously with the evolution. You touched on something else, Chris, that’s really pertinent here. It’s not just releasing a bunch of water downstream. And it's not even just the flood. But, because this maintenance and this upgrade wasn’t done, everybody, I think, has seen the water that is leaving, running down that embankment. This is water that’s extremely turbid with a lot of soil suspended in it. This is going to cause a loss of oxygen, fish are going to die, habitat is going to be destroyed. This is an ecological disaster that’s already taking place. Beside the liability, honestly I don’t know if this dam is going to make it or not. That’s a frightening statement to make. We’ve got rain coming, as you’ve pointed out. It’s a significant amount of rain. They’re anticipating days upon days of rain. They can only lower the pool so fast because of the crippled spillways that they enjoy and I don’t know, I don’t know what’s going to happen here. If this dam would fail, it would be catastrophic. It would be catastrophic to the state of California. It would be catastrophic to the nation. This is an important dam and an important element of our infrastructure. And the loss of – if you set aside life, which is hard to do and just look at the money already lost. When you move 100,000 people out of their homes you know you can spend a lot of money to keep that from happening. That is a huge, huge cost to the whole of us. And this ecological exacerbation is on top of that; so now we’re going to lose fish, we’re going to lose habitat, the stream is going to be choked with mud, the dam downstream is going to have to be dredged behind it. All because we didn’t want to spend the money to do what we probably should have done with this emergency spillway, and to spend the money on the maintenance of the primary spillway. Chris Martenson: And it sounded like relative chump change given what you just outlined there. So, in closing last question: What sort of numbers are we talking about to fix just the dam portion of this story? Is this hundreds of millions in deferred maintenance? Is it billions? Is it trillion? We’ve seen big numbers that the society for civil engineers is throwing around for totally getting our infrastructure in America back to first world standards. What’s the dam portion of this bill do you think, where would we begin to get a sense of the range on this? Scott Cahill: I calculated that not too far back believe it or not. President Trump has said that he’s willing to set aside 550 billion dollars for infrastructure. That is a magnificent amount of money. If he would just call me, I would tell him that it needs to be closer to 2 trillion dollars. I wish it were otherwise, but it’s not. When you start adding up the numbers and applying percentages and applying averages for cost of maintenance to bring things up to an acceptable level, it goes quickly. Here is the model. A contractor could have gone out and grouted the spillway and put new drains in. And if he did a really great job and fixed it all up as good as it could be, he would have spent perhaps $500,000, maybe a bit more. A contractor could have gone and lined the emergency spillway, he probably would have spent 5 million dollars doing that. So, for 5 million, call it 6 million. Now we’re looking at 200 million dollars. Not to mention all the other costs that we don’t even calculate here. And God forbid, if we’re talking about the losses of a partial breach of a dam. It’s so fool hardy to save that penny when all the dollars that are lost when things go badly, as things are doing to some level here. I believe in it. I think we’re talking about a 2 trillion dollar problem, that all doesn’t have to happen tomorrow, but it does have to happen. We can’t let it go any longer. It’s to a point now where we must address it. Chris Martenson: I totally agree and it would be money well spent, obviously and would get us up to acceptable standards for safety and quality, as well. And also, just the joy of living around beautiful, well-maintained things which has a value all on its own. I just took a train from basically from Hartford to Washington this morning and got to see the state of our rail system. This is Amtrak, not to beat on them, but lots of concrete out there that needs replacing, as well. So, it’s very visible, it’s very obvious. But in this case it was highly disruptive. And if you think of 100,000 people, every $10 that they’re out in this story, lost wages or whatever is another million dollars in that story of loss. Yeah, for penny wise pound foolish, totally understand that. Really, being large, I hope we learn the lessons from this. Not clear that we did post Katrina really get a lot of lessons out of this, but sometimes it takes two big life events to get us back on track. So, with that Scott, thank you so much for your time today, really appreciate it. What an honor to talk with an expert such as yourself and thank you for writing what you did and putting your name out there. And I didn’t consider it alarmist at all, but rather just this is a possible thing we might consider as part of landscape here. So, again thank you for that and thank you for your time today. Scott Cahill: Thank you so much for having me Chris; I enjoyed talking to you. Great episode. Really glad you decided to cover this fascinating story as it unfolds. Great job getting Scott Cahill, who seemed like a real expert, on the show. You briefly mentioned the 2005 FERC relicensing proceeding where Friends of the River, Sierra Club, and SYRCL raised concerns over the unarmored emergency spillway and predicted the erosion that precipitated the evacuation yesterday. This story was originally broken by The Mercury News and more recently covered by The Washington Post. What I found disturbing about the media coverage was that none of the articles actually linked to the filing. I could not agree more that individuals must take responsibility for themselves. Accurate first-hand information is critical to making the right decisions. However, the media rarely links to its sources giving readers little more than a few quotes to base judgments on. Anyways, I dug the source document out of the FERC website and posted it to Scribd. What I found most damning about this Motion to Intervene was the final page where the emergency spillway is aptly called an unarmored "spillway without a spillway" and hillside erosion is suggested as a likely consequence. The State Water Contractors responded with the sole argument that Friends of the River didn't prove erosion would occur. But shouldn't the burden of proof be flipped? 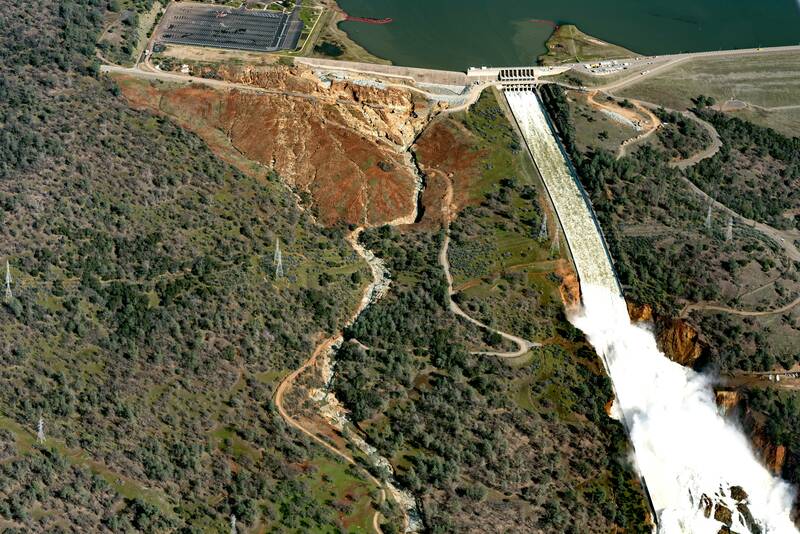 Oroville Dam should be provably resilient rather than unproven deficient. On second thought, helicopters dropping boulders and sandbags sounds like a really good idea. Wow, that's the best picture yet that shows why they are so worried about any more water going over the "emergency/auxillary" spillway. "This is the first time water has risen to this level in the history of this dam." "This will be the first activation of the emergency spillway." When I heard him say this, it got my attention. Until an item or a process has been actually tested, you have no idea if it will actually work. Ideally, you never want to be the first person or group to go through an "error condition" or situation. Awesome interview. I really enjoyed the guest's perspective. You don't really want an optimistic engineer working for you. Instead, you want a cranky, pessimistic one, that thinks that everything is probably going to fail. That raises the level of operational stress you are under, but the chances of actual failure go way down. That's my perspective anyway. I've dealt with both kinds of thinking, and as a manager, I was always much more worried about the optimistic engineer's projects. I knew from my own experience that if they weren't worried, then they weren't really that aware about how complex the whole thing actually was, and all of the possible failure modes it might have. I was always pleasantly surprised when my code went an entire release without some big problem happening that was traceable back to my component. I wonder sometimes if the people who design planes are actually comfortable flying in them. They know all too well just how many things can go wrong. When the news breaks that a plane has actually gone down, I'm willing to bet that each engineer is secretly praying that it wasn't their subsystem that failed and caused the crash. You can be sure it wasn't a cranky engineer who called it an "auxiliary" spillway. That had to have been someone in Public Relations. Or Marketing. Nope, not helicopters and rocks. You need a strong mesh there. You get all the prestressed piles and girders you can, steel girders too. You fly them in there, and then with early-strength concrete you bind them together and drop them in place into a giant truss. wherever you can, you bolt them together. Where you can't, rebar plus concrete will do. Then with the truss, you fill in with smaller elements, a mesh across that. then smaller again, your final layers are -- what? You need an elastic wall. I might well go for wood on the outer layer. Then you drain the entire thing, and rebuild it right. I'm not a "dirt engineer", my field is elsewhere, but Fairfax is right on with the Cranky Engineer paradigm. Alas, they are often ignored. Cranky engineers (I am one of them) know and believe that *everything* has failure potential, and usually multiple failure modes, and push for design margins to cover contingencies. It is always a tension between the funding money and making a system as robust as forseeably possible. This is how Fukashimas (and apparently Orovilles) happen. I understand cost constraints too, but safety-critical systems deserve extra attention. It especially disturbs me that,if this issue winds up turning on cost decisions, that there will be nobody at all held accountable due to the "those decisions didn't happen on my watch" aka widely distributed accountability syndrome. I wonder if there will be an Erin Brokovich type dirt engineer coming forward at any point with some answers. In the meantime, I hope the thing doesn't go completely off the rails before they can get a maintenance availability to patch it. I understand there is a bit of rain coming up in the region. I heard that erosion rate supposedly has a cube relationship to volumetric water flow (another one of those exponential things!). Can anybody here confirm or expand that? Haven't listened to the podcast yet, going to do that as soon as I have a few minutes. The plan on the ground at the dam is to try to get the lake level to 850 feet before the rains start up on Thursday. A source on the ground at the Oroville dam has sent us these images (taken approximately at 10:30am PST 2/14/17). The carrying capacity. (Erosive capacity) of water varies as a cube of its velocity. Given infinite funds therefore ( or even funds diverted from gender alignment surgery) the spillway should follow the contour lines until it finds an entry to an underground aquifer. The debris from the erosion in the primary spillway, combined with the debris from the use of the emergency spillway, has collected where those spillways run off into the Feather River. This is causing the waters to back up towards the dam itself, and have flooded the power station there. In addition, a wall associated with the power station is about to fail, which will add to the damage/destruction to the facility. The power station is not going to be operational again for a long time. And will likely be very costly to repair/rebuild. The 17,000 cfps outlet for the dam located near the power station is now no longer an option. Given that, and given that the emergency spillway is in such dire shape, the compromised primary spillway is now the only option for reducing the water level behind the dam. The turbulence of the waters swirling around the spillway debris may likely increase the erosion factor of the dam's earthen berm, increasing the odds for a catastrophic failure. We'll report more as we learn of it. Thank you so very much for having me on your podcast about the Oroville dam and issues of infrastructure and the national dam inventory. I had a wonderful time and truly appreciate the opportunity to talk to your community and to become a part of it. Scott, that was a great interview and very helpful to all who listened to it. Thank you for your candor, expertise and availability! This is a failure mode that I had discussed some time ago in my writing. The eventuality of this flooded toe of the dam is erosion of the embankment. As the pool beneath the dam forms, and the spillway remains actuated, the pool will begin to rotate counter-clockwise. This will cause erosion of the toe of the dam, the power house area, and depending on the specifics, potentially significant erosion of the downstream face. The spillways will be needed again in force if the rain that is anticipated comes. The possibility of renewing the evacuation and of a possible event is very real. It's all safe now. Expect heavy traffic on the way back in to town. The spillway has been thoroughly inspected. It wasn't the government's fault. Doubleplusgood! Oh, well this explains why they'd lift the evacuation. Ugh. Thank you Scott, for sharing your expertise with us. 1. Given enough time and money engineers can solve any problem. 2. There's never enough time or money. Here are some actual engineering rules. Design something with high quality and cheaply, but it will take a relatively longer time. 3) Adding people, to an already-late project, makes the project finish even later. [ibid] In truth, all you can really do to speed up development once you're staffed up and the project is in progress involves removing features, or decreasing quality. A common request is, "Let's say we shorten the testing phase." This results in more bugs, guaranteed. These are truth for software engineering projects. I can't speak for the guys working with the molecules, but I suspect some of the same limitations apply. Not sure if this is of any interest. Nov 1974 California Water Project Storage Facilities Bulletin. You can pick any two. Noting #2 above, not sure how they are going to wind up with a good fix without a hell of a lot of ""money"". They appear to be running out of time. Unless it's Scotty. He can always complete projects in half the time. This is a high res photo taken (apparently) yesterday. If you look below the two pylons on left hand side of the main spillway, where there is a bend in the dirt road and below, there are huge cracks running all the way down the hillside. If this earth was to slip downwards, would it potentially block the river and what impact would this have on the toe of the dam? Looks like it's going to be pretty wet. The Canadian model pretty much agrees. Given the evacuation order lift...using this time to move anything important out of the potential flood zone would be a prudent course of action IMO. As well as leaving prior to the onset of heavy rains. I didn't create this, but wanted to pass it along. "Let's begin by gathering current data for the Oroville dam from cdec.water.ca.gov. This dataset can be found here. Thanks for the photo. Very helpful to see the extent of the scour damage all over the place. To me it's not clear that the dark reddish line beneath the pylons is a crack in the earth. It is right next to other tire marks so it could be a path of some sort? Also, the 'crack' seems to stop right at the road. I can't really tell, but it does not seem to go further, and that seems odd to me. Nor are the vertical markings at the bend obvious cracks to me...could be gullies (of shallow depth) instead? But, again, it's not clear to me that we are looking at a crack, or cracks. In this photo you can see the drains actively flowing above the failure site.They cease to flow below the failure, indicating that the water is no longer under pressure and has been relieved by the failure of the spillway surface. They also appear to flow stronger the higher up the face they are. This would be because some of the water is released along the spillway side curtain, as seen in a following photo. I think this leak has been in place for a long time, and has only recently exposed itself in a surface failure. They previously attempted to patch the crack, without solving the under surface situation. This image seems to support the increased flow observations from earlier. Also note no flow below the failure point. This is only on the “Left” side of the spillway, the right side still flows below the failure site. Also, lots of flow….without much spillway pressure… possibly indicating a pool breach pressure source. Note, flow continues past failure on left side of picture. Does not appear that pressure is coming from spillway source. Not a good sign. Tapping into energy resources comes with costs. Which one will be next? Coming to a local oil field near you! That reddish line looks more like plastic perforated construction limit fencing - more for personnel safety. The "cracks" below the hairpin bend look more like gully erosion. With all the recent rains, water likely collected along the roadway to the hairpin and then took the path of least resistance downhill. The soils are variable, but fairly shallow. As Scott noted, there is plenty of "rotten" weathered rock. Weathered rock isn't as competent and erodes much more quickly. The weathering generally progresses from the surface along joints or cracks in the rock where water can percolate more easily. Weathering generally takes place over long time spans. Nonetheless, fast moving water dislodges weaker rock and batters more competent rock with it. Although the situation here is far from desirable, the water coming off the spillway is running clear. That tells me that it is reaching a point of stasis. Unless the flow rate through the spillway increases, it is likely stabilizing. That's as good as can be expected at this time. Looking near the left side of the emergency spillway, there is a rounded erosion feature that is being "repaired" by boulders and a concrete pumper (equipment with segmented green lines.) Time2Help posted an aerial photo that showed this feature a couple of days ago in the daily digest. That feature is likely what caused officials to issue the evacuation order. Angular "V" shaped features are more common in competent rock. Rounded erosion features like this are indicative of foliated (platy) weak rock. This localized weaker rock could easily extend under the emergency spillway. If water flowing over the emergency spillway continued to erode this feature toward the weir, it could easily undermine the weir and tunnel to the reservoir. That would have been potentially catastrophic! The emergency spillway has other undesirable attributes. This was just the most noticeable. They need to do whatever they can to keep from using the emergency spillway. We're not out of the woods yet, but the situation isn't as dire as it was. If I were advising the authorities, I would suggest building a temporary dam (with a sequence of boulders, cobbles, gravel, and an impermeable membrane) downstream of the power house and then pump the tail water out. This would prevent the sloshing tail water from further damaging the power house and the toe of the dam. It would also allow more discharge through the spillway (if possible/necessary) to keep water from flowing over the emergency spillway. BTW, Scott's explanations were wonderful - easily understood and technically founded. Edit - peterkukendall wrote on the "Oroville Dam Threatens to Collapse" thread that operations are ongoing to get the power plant back on line. My suggestion to dewater the power house can be ignored. I whole heartedly agree - this was a serious and tenuous event. It was very poorly conveyed - Thanks for the kind words, too. I am first going to say, thank you all for the intelligent, well-written, consideration of this issue. The nice comments mean the world to me, and have made my day today. As I write, the rain is falling across the watershed. It is a horrifying and unacceptable evolution that we have seen develop. Lets all hope that the dam holds. It is an odd thing, playing Chicken Little to an ever decaying infrastructure, one must warn because it is honorable to do so. Still, the bad part may, out of frustration, begin to actually hope for the worst, to allow, at last a universal understanding, to get it over with, so we may start, at last, to make things right. I have torn the tiny devil from my shoulder and have stomped him thoroughly. I am listening to the little angel that sits on the other. If we must suffer a dam breach in order to become responsible, let it not be this dam. There are too many good people in its shadow. The water is too precious, and the ecology of the region too valuable. Perhaps, if mankind cannot learn without tragedy, let it be on some remote mountainside or coastal area, where no one must die, where no home is lost. Thank you for your thoughts and assistance, and for being the informed minority. I am so honored to be a part. FLASH Flood Watch IN EFFECT FOR THE Auxiliary SPILLWAY AT OROVILLE DAM IN BUTTE COUNTY CA... The National Weather Service in Sacramento CA has issued a Flash Flood Watch for the Auxiliary Spillway of Oroville Dam in Butte County. Officials managing the incident indicated that the situation has stabilized sufficiently to lift mandatory evacuation orders. However, voluntary evacuation notices are in place. Flash Flood Watch for Auxiliary Spillway of Oroville Dam on the Feather River in Butte County California. Watch will remain in place until the situation changes. Residents are urged to follow emergency instructions from local authorities. A 'watch' is a level below 'warning.' The evacuation 'order' remains voluntary. It just means that the new storms are being monitored very carefully. If I lived in the direct floodplain there I would probably just pack up my most valuable things, secure everything else and go hang out on higher ground until the next storm passes. The latest GFS run continues to show storm after storm affecting the area for the next 15 days. Looks like a lot of rainfall is on tap. I do not know how much needs to fall within a specific period of time to present additional problems, but many inches appear to be in the cards over the upcoming days for the areas that will run off and pour into the lake. And we had better hope they don't have an earthquake any time soon. I would think that after the rains stop and the river level goes down, there will be a great opportunity to do some gold panning. All that erosion and silt has to result in re-depositing some gold flecks in the area. With all the heavy rains in Northern CA this winter, I've heard that those into gold panning will but out in force this summer. I'm guessing that's why they named it "Oroville". Gotta be some gold in them parts.....Aloha, Steve. If I were in Oroville, I wouldn't be trusting my and my family's fate to forecasts and government assurances. I'd be using this time to gather and move out as much as possible to higher ground. The local authorities have shown more than once that they are a day late and a dollar short when it comes to warning the people adequately. Canadian model just went ballistic with rainfall for NorCal over the next 10 days. The 12z GFS isn't quite as wet, but it's wetter than it's 6z run and 0z run. Taken Monday Feb 13. This angle shows the depth of the erosion channels. Level dropped to 859 feet. Judging by the rain we have been getting in Sonoma county all morning that will reverse soon as the storm makes it there. The storm that was supposed to arrive Thursday did not amount to much thankfully and there has been a long lull till now. Snow level expected to be 6000. Luckily the really heavy rain falling much furthur south for this system. But we still have a long period of potential rain..into June not unheard of, and all that snowmelt still to accomodate....most spots in Feather River Basin are close to or exceeding 100% of average. Maybe the engineers who designed the damn needed to plan for a 10,000 year event. But more than likely we are entering a cycle of unprecedented 1,000 year and 10,000 year events happening more often. Welcome to the Anthropocene. Who Will Be Blamed if the Oroville Dam Fails? Here's a good commentary from the Mises Institute. Marc Reisner is the author of Cadillac Desert, probably the best book on water in the Western US. Not out of the woods? Certainly it seems that the situation at Oroville dam has stabilized and is well under control. The water levels are way down, and seemingly safely so. However, there's an indeterminate but probably significant amount of rain on the way. Deserves watching, of course. So hopefully out of the woods, but there might be a few trees scattered about in our field of view yet. I live about 100 miles SW of Oroville, near the coast. The rains today have arrived in earnest. I'm checking the dam water level at Oroville hourly to see if/when it starts rising again. So far so good, but I expect a reversal to happen within the next few hours given the rain intensity. I'm a little surprised to see the rain inches accumulated at the Oroville dam haven't changed in the past 4 hours, given that it's been raining steadily all day where I live and that Oroville should be getting my weather within an hour or two. Perhaps this storm is just moving really slowly. Anyways, I'll be surprised if the dam levels don't start rising by nightfall.